The red supergiant star Betelgeuse in the constellation Orion. Credit: NASA/ESA/A. Dupree. Two bright regions visible in recent astronomical observations of the massive star's surface provide more evidence for the Electric Star theory. Betelgeuse is one of the largest stars in the observable Universe. If it was placed in the Sun's position, it would be larger than Jupiter's mean orbital diameter. However, the star's material structure is so diffuse that the orbits of the inner planets might not be affected at all. 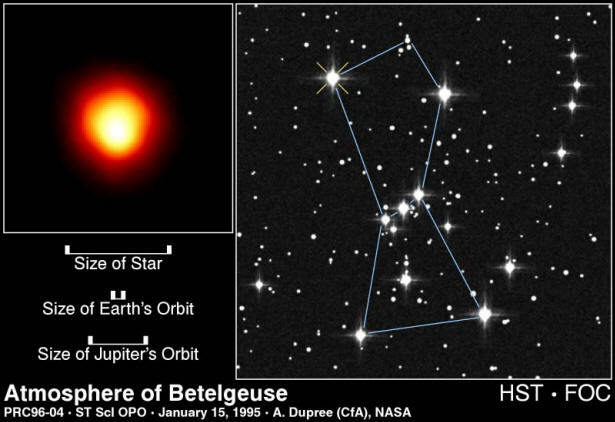 Betelgeuse is the upper left star in the constellation Orion, also notable for the Orion Molecular Cloud Complex, a topic of several previous Picture of the Day articles. The star is considered youthful by consensus astronomers, but nearing senescence because its extravagant radiative output exceeds 100,000 times that of our Sun. According to a recent press release, sunspots have been found on the surface of the stellar behemoth. However, there are only two of them occupying over one-third of its surface, and are said to be the signature of heat transfer from the interior through "matter convection". As the report suggests, the star is acting like a pot of boiling water—a strictly mechanical phenomenon. Betelgeuse is notable for gigantic "bubbles of hot gas" that are in constant motion—bubbles as large as the star itself. Since it has been observed to eject massive amounts of stellar material, greater than six-times its diameter, it has been proposed that Betelgeuse is undergoing violent vertical oscillations just beneath its surface. It is that energetic motion that is causing the "hot gas" to blast into space, just as bubbles in boiling water erupt with puffs of steam. The Electric Star theory provides another explanation. An explanation that relies on the electrical connection stars have with their galactic neighborhood, and with the Universe. Stars shine because electricity flows through each galaxy. 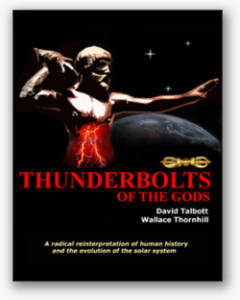 As has been written in these pages many times, stars can be thought of as giant spheres of slow-motion lightning. It is this simple hypothesis that best matches observational evidence. 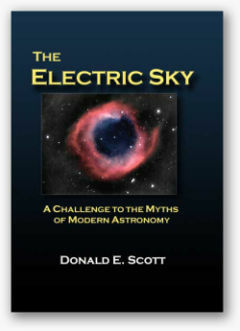 Retired Professor of Electrical Engineering Don Scott wrote in his acclaimed book The Electric Sky that a star's size, luminosity, and color have little to do with its age. Stars fall into position on the Hertzsprung-Russell diagram because of the input they receive from galactic electrical circuits. As Dr. Scott wrote, the primary indicator for a star's behavior is the current density at its surface. Stars do not rely on internally generated fusion fires to supply them with energy. Red giant stars are relatively cool but extremely bright, so they are interpreted to be quite large. Scott proposes that the "giant" characteristic is a result of an exceptionally broad corona and not because the stellar disc is oversized. The star might be small inside its extended, energetic atmosphere. The fact that Betelgeuse has a temperature measurement of about 2900 Celsius calls into question the thermonuclear model of stars. How can such cool temperatures create a radiative output that is so extreme? “Red stars are those stars that cannot satisfy their hunger for electrons from the surrounding plasma. So the star expands the surface area over which it collects electrons by growing a large plasma sheath that becomes the effective collecting area of the stellar anode in space. The growth process is self-limiting because, as the sheath expands, its electric field will grow stronger. 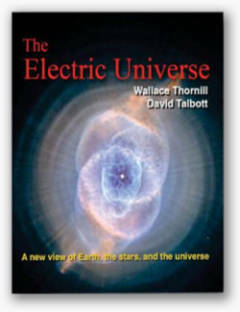 Electrons caught up in the field are accelerated to ever-greater energies. Before long, they become energetic enough to excite neutral particles they chance to collide with, and the huge sheath takes on a uniform ‘red anode glow.’ It becomes a red giant star." Betelgeuse is an electric star, and the bright regions are areas where electric currents are flowing with the greatest Amperage.